I’m betting you’ve had Horiatiki Greek Salad before even if you don’t know what the heck Horiatiki is! It’s just the Greek name for that cucumber tomato salad that’s so ubiquitous (look at me with all the big words, today!) all over the United States. And in Greece, too, from what I understand, where it originated. I love this simple salad. I think we probably made variations of it on a weekly basis all summer long for the couple years I stayed down at the folk’s house helping them out. But we had great tomatoes we grew ourselves. I couldn’t pull it together to get a garden going at home this year other than my favorite herbs (I can’t live without my herbs and bring them in during the winter) and a few cherry tomatoes which are finally coming in. So yes, it’s time for me to make my Horiatiki Greek Salad! 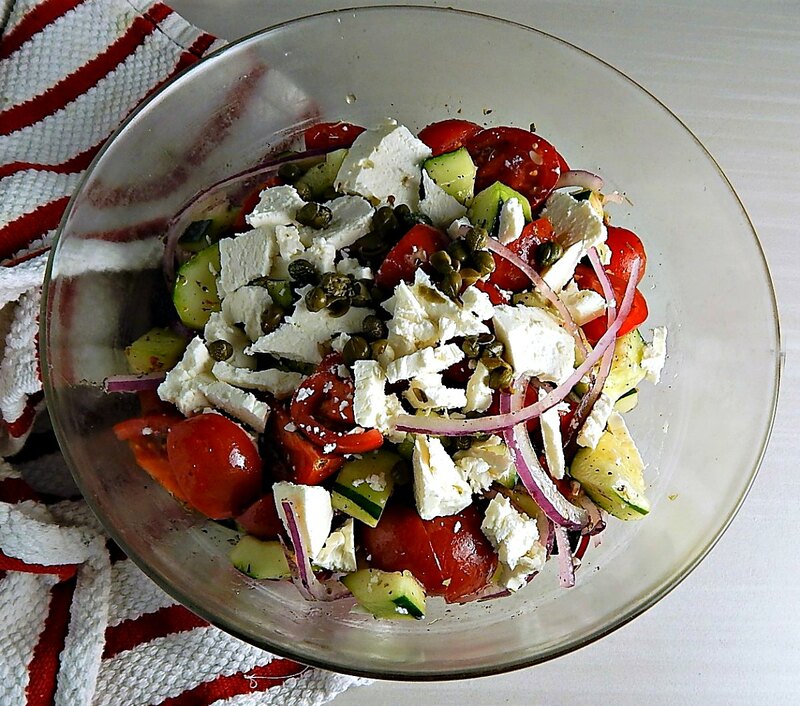 At it’s simplest and probably, from what I hear, most “Greek-like” Greek Salad is just tomatoes, slices of cucumber, and onion with large slices or chunks of Feta cheese over top. It’s dressed simply with olive oil, oregano, and salt. There are many “add-ins” that are considered “proper.” Think about adding in green pepper chunks, Kalamata olives, capers, mint or artichoke hearts to stay in the bounds of Greek tradition. Horiatiki Greek Salad is so absolutely refreshing on a hot August day. Even though most would consider it a “side” I can absolutely just make a meal of it and be perfectly happy. Most, I’m guessing, want to serve something else with it. Horiatiki Greek Salad goes great with just about anything. Maybe any lemony oregano Greek-style Chicken Kabobs or a Grilled Chicken Breast, or a Marinated and Grilled Shrimp. Or maybe as a side for any summery burger or steak, as long as it isn’t heavily flavored towards a specific cuisine. Horiatiki Greek Salad is also seriously the perfect thing to bring to a summer potluck. Now the more Americanized versions of Horiatiki Greek Salad often contain a little more acid than just the juices from the tomatoes, usually red wine vinegar and/or lemon and sometimes you’ll see a pinch of sugar, too and probably black pepper. We also tend to like to toss in things like Greek seasoning, parsley or green onions, maybe red onion or colored peppers or pepperoncini instead of the plain onions and green pepper. Hey, I’m all for mo’ flavor! In the US, you’ll generally see our cucumbers and Feta in chunks, too, instead of slices. And we might just add chunks of grilled chicken into the Horiatiki Greek Salad just to make it a full meal. And sometimes we’ll use a creamy dressing instead of a vinaigrette, too. Oh, wait a minute! That sounds like my Greek Chicken Salad Sandwiches! So go ahead and play with your food and add in what you like. Seriously, it’s hard to go wrong when you’re talking fresh summer veggies! Make sure to make good use of any potential waste! It really helps when shopping for vegetables to be mindful of the sales. Buy and use more of the things that are on sale, maybe pick up extra at the end of the week to last through the next week if the veggies on sale are things that you love and use regularly. Green bells are always less than the colored bells. Cucumbers are often on sale buy one get one. Different tomato varieties seem to go on sale every week. If you don’t have another use for the rest of your Red Onion, consider making Pickled Red Onions. One thing I really do like in my Horiatiki Greek Salads are capers. They’re little brined berries and they really do add an extra layer of flavor. They’re a specialty item I don’t ever see on sale, but I do find them all the time in the bins or carts of mostly “gourmet” items that are nearing their “Best Used By” date. I use capers, too, in my Chicken Piccata. Check those bins when you see them. You’ll never know what you might find. I highly recommend if you don’t have the seedless “English” cucumbers to cut your cucumber in half and scoop out the watery seeds. Personally, I like to remove a little of the cucumber rind, in strips; it can be a little bitter. Don’t waste that flavor, though. Use it for what I call “Spa Water.” Just toss the seeds and strips into a pitcher or Mason jar, fill with water and let it steep and you’ll have Cucumber flavored water, which is delish! The Feta cheese is one of the big-ticket items in this salad. It’s actually getting harder to find the block Feta in my stores because so many people buy the crumbles. Stay away from them. They seem so much cheaper than the block Feta – but they’re not. They’re just “fluffier” and if you compare the two packages side by side, you’ll see the same sized package but the crumbles are about half the price of the block. They’ll look like a deal. But look closely; you’ll find there is 1/3 to a 1/4 of the weight of crumbled Feta compared to the weight of the block Feta. If you buy that package, you’re paying as much as four times the amount for an inferior product. The crumbled Feta doesn’t last in the fridge like the block Feta does. The brine it’s stored in (that’s the water substance) keeps it fresh. I also recently picked up a great tip from Elena Paravantes of Olive Tomato on keeping your Feta. If you open up your Feta and use part of it and there’s not enough brine (or no brine to start with) to cover what’s left, or if you spill the brine, make your own to replace it. And put it in a good container that won’t spill. Use two to three ounces of (preferably kosher) salt per 4 cups of water for the brine. That’s going to be about a heaping tablespoon for a cup. Let it cool before pouring over the Feta. Your Feta can be kept up to six months this way. Mix the dressing first, so the oregano or Greek seasoning has a chance to soften a bit. In a small bowl or jar, add olive oil and vinegar. Place oregano or seasoning in the palm of your hand and crumble it with the fingers of your other hand to help release the oils. Add the Oregano or seasoning, along with salt and pepper to jar or bowl and shake or whisk until emulsified. Add vegetables to a bowl and toss with the dressing. Top with Feta and capers. Best if this sits for a few minutes before serving. If you’d like to make a larger amount of the Vinaigrette to have on hand for more of this salad or other salads, see my post on Greek Dressing. Just increase the oregano to 3 tablespoons. You’ll want a strong dressing for this salad. I’ll be sharing Horiatiki Greek Salad at Fiesta Friday 236, hosted this week by Julianna @ Foodie on Board and Debanita @ Canvassed Recipes. Stop by and take a peek at their sites. You’ll love Julianna’s food – everything she makes has a special touch that takes it over the top. I’ve only just began exploring Debanita’s blog, but the scope of her recipes is outstanding! You never know what you’ll find. This entry was posted in Click here for Fabulous Food Posts and tagged capers, Cheese, Cherry Tomatoes, Cucumber, Feta, Greek, Olives, Red onion, Salad, side salads, Tomatoes. Bookmark the permalink. Hi Sophie, and thanks so much! Baguettes would be wonderful! I love flatbread or pitas, too. But there’s nothing like a baguette, is there?! This is a lovely classical Greek salad that I absolutely love & we like to eat it with home-made baguette, is just wonderful! Interesting – when I think of Greek salad olives are always first to come to mind but clearly they’re not even essential! I do love olives and would have put them in but I was out! I always think of olives whenever I think of Greek food! The capers worked well, though. Yes capers would make a great alternative – I always have a jar in the pantry! Nice and refreshing for those hot summer days… which seem to be most of ’em hereabouts! I feel like this has been the hottest summer ever in MN. I haven’t checked the actual “stats” but it’s been insane. My cherry tomatoes love it! One of my favorite summer salads! It always hits the spot, doesn’t it! Especially in this heat. Your salad looks fantastic. I’m sure its a burst of flavours. I love your tip about re-using the cucumbers in Spa Water. Thank you for sharing such a wonderful recipe with us at Fiesta Friday. I’m sure everyone at FF will ❤️ it. Thank you, and thanks for hosting at Fiesta Friday! I can’t wait to try that blueberry ice-cream I saw on your blog!! I loved that tip about the Feta and the last little bit of Feta is safely ensconced it the homemade brine. Thanks so much!! I appreciate it! Well that’s a wonderful thing! I think they like filling it up with the Romaine because Romaine is one of the least expensive lettuces! But maybe I’m just a little cynical about our restaurants!! Or right on the money…. So good to know, lol!! Hmmm – does that mean it’s not very sophisticated, I wonder! I am going to have to check out your salad, too, Sophie!! We love grekisk sallad (Greek salad). We like it served with Kalamata olives and fresh red paprika (pimentos). Such a great fresh salad anytime you have fresh ingredients. You know I thought I had olives but I didn’t. Well, I had Spanish ones, which imho are best in a bloody mary!! No Kalamata, though. Thanks, Ronit! Doesn’t it just scream summer!